Grave Memory is book 3 in the Alex Craft series. I'm still loving how this series is going and plan on binge listening to these as fast as the library lets me. The series itself revolves around Alex Craft, a grave witch that also does PI work and consults with the police from time to time. It's a pretty rich paranormal world with witches, ghosts and fae mixed in. I'm going to just dive right in since I've already explained about Alex and what she is. This installment we have Alex determined to solve an odd case. She's out and about when she winds up at the scene of a suspected suicide, yet the ghost is saying he didn't jump. No one seems to believe there is foul play and yet with digging Alex is finding a connection with another mysterious suicide. As she unravels more details, we realize something dark is at work and the only one that can help is Alex. 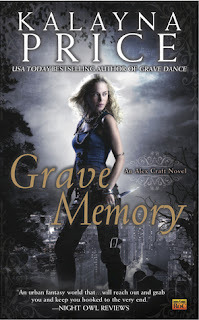 Grave Memory is another great addition to a series I can't put down. I was so happy to get a bit more info on the fae as well as finally learning about the soul collectors. The slight romance aspect on the other hand leaves a bit to be desired, but I'll hope we get more of it later in the series. All in all, I'm loving this series and would recommend it to fans of fae Urban Fantasy novels. yes I really like this series! Oh wow. I'm glad you're having a great time with this series and it do really sounds good. I'll definitely keep this series in mind. Great review! I haven't read it but the bloggers really seem to be liking it. Glad you're still enjoying the series. I really wanna get around to reading this series sometime. You should give it a try, I'm liking each book more than the last so far! I haven't heard too much of this author but she sounds wonderful especially with the Ghostly elements. This is a series I have the first book of and would like to get into it.